Dry Needling treatment offers a great solution if you are SUFFERING from a SPORTS INJURY or other CHRONIC PAIN? Functional Dry Needling, is a form of IMS. It brings lasting relief for a broad range of neuromuscular dysfunction. Following injuries or other degenerative processes, many patients suffer from muscular tightness and spasm. This often leads to compression and irritation of the nerves exiting the spine. When these nerves are irritated, they cause a protective spasm of all the muscles to which they are connected. This is a natural response from the body attempting to protect itself, frequently results in referral pain. This referral pain can lead to secondary dysfunction such as carpal tunnel, tendonitis, osteoarthritis, decreased mobility, chronic pain and a range of other disorders. This scenario can be difficult to treat because the true source of the problem is “hidden” and undiagnosed. For these patients, standard treatments are often ineffective resulting in continued limitations and chronic pain. Dry needling is a highly effective treatment, unequaled in identifying and eliminating these referring or “hidden” sources or neuromuscular disorder. The treatment involves identifying the source of the pain and advancing a small filament needle into the related muscles, eliciting a small twitch response and then a relaxing of the muscle! The identification and stimulation of these trigger points can “reboot” the muscle to alleviate both the original problem area as well as the secondary pain. Many patients experience dramatic pain relief and improved function in just a few treatments, often with lasting relief. GAIN RELIEF & LOSE THE PAIN!! TALK TO YOUR PRACTITIONER ABOUT DRY NEEDLING TODAY! 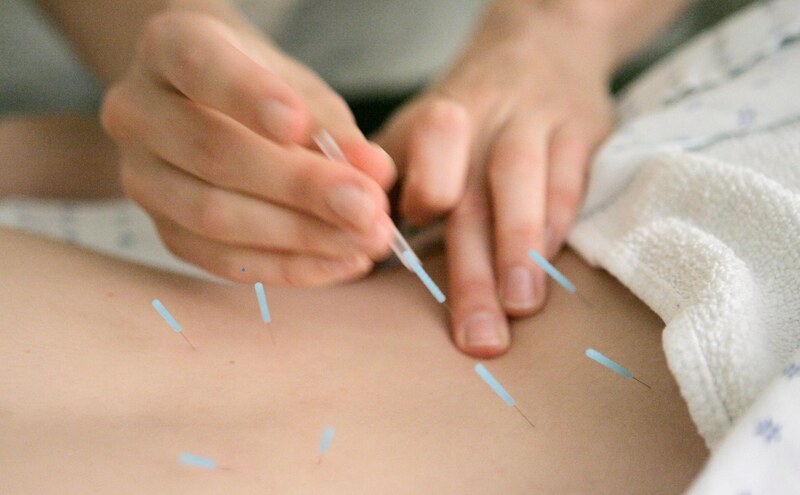 Are there any complications associated with IMS and Trigger Point Dry Needling? A stuck or bent needle is an uncommon but significant complication that may require medical attention. Puncture of vital tissue (e.g., a puncture of lung tissue causing it to collapse which is called a pneumothorax). Can the risks of complications be reduced? Communicate with your physiotherapist throughout treatment. Discuss your treatment and ensure your questions are answered. You can request your physiotherapist stop needling treatment at any time. Action Sports Clinic has a multidisciplinary team of physiotherapy, chiropractic, and massage therapy professionals serving the active community of downtown Calgary. As a team, we strive for excellence in evidence-based and personalized care for musculoskeletal injuries and conditions. Combining the unique strengths of each professional discipline, this integral approach to care enables each patient to draw from the expertise of team members. This eliminates the traditional barriers of communication between busy practitioners, thereby ensuring collaboration and effectiveness of treatment programs. We are athletes ourselves…and we understand the needs of sports minded clients. We believe that participation in physical activity is an important part of health and vitality. The pursuit of dreams, setting goals, and the drive for personal achievement are all values we believe in and aspire. We Are One of the Top Teams of Physical Therapists in Calgary. "I attend Action Sports Clinic to see my physiotherapist - Darra. Darra is very knowledgeable, attentive, and truly knows his sports medicine. I would highly recommend Darra to anyone who has a sports injury or is in need of physiotherapy.The front desk staff are very friendly and helpful, and are able to answer all of my questions." "Initial Assessment went well. Office was busy but staff were attentive and on the ball. Dr. Rennick was gentle and adjusted my back well. I will be back for another appointment." "Knowledgeable, friendly and intuitive staff. Allison is the best physio I've worked with and Dr Sean is a natural healer." We specialize in the practice of Sports Medicine and provide services related to Sports Therapy, Chiropractic Care, Physical Therapy, Massage, as well as off the shelf and custom Bracing & Orthotics. To learn more please visit our “Services” section of the website.